I had one of those weeks where I just needed a bite of junk food. Well, 4 bites. Or 4 whole cupcakes. I went to Texas for a quick trip, but landed in Urgent Care with Camille for a double ear infection. Everything is fine; we’re back home now after a slight delay, but man, it was a hard week. I don’t handle sleep deprivation too well (it’s funny how little they talk of this in baby-prep classes), and I’m still struggling to catch up. I need comfort in the form of a chocolate cupcake. And not just any chocolate cupcake. I want that cupcake to be stuffed with fluffy marshmallow cream. And in order to get to that hidden bit of marshmallow heaven, I want to bite through the thickest, richest chocolate ganache frosting. Specific/nitpicky/annoying, I know. So, I rolled up the sleeves on the denim shirt I wear about 4 days out of the week, and made a small batch of chocolate cupcakes. My recipe makes just 4 cupcakes. Since this is Dessert for Two, I figure two people can hold a cupcake in each hand, and have two big grins on their face. Ergo, 4 cupcakes = 2 servings. It’s the only kind of math I’m good at. Hate me forever, but cupcakes are softer when they’re made with oil instead of butter. Unless, of course, you eat the cupcakes hot right out of the oven. Or, another exception is when the cupcake batter contains sour cream. But, in general, butter hardens at room temperature, making a cupcake too firm. No bueno. 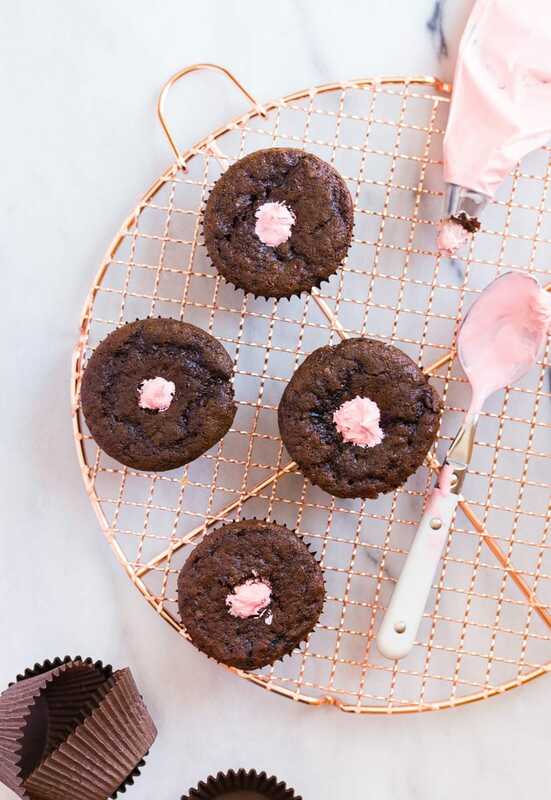 My go-to small batch chocolate cupcake recipe doesn’t require eggs. No real reason; I just found all the lift I need in buttermilk + baking soda. If you don’t have buttermilk, add a splash of vinegar (like, 1/2 teaspoon) to your milk about 5 minutes before you need to use it. You can also thin-out some sour cream with milk instead. Or, yogurt! We have options here! 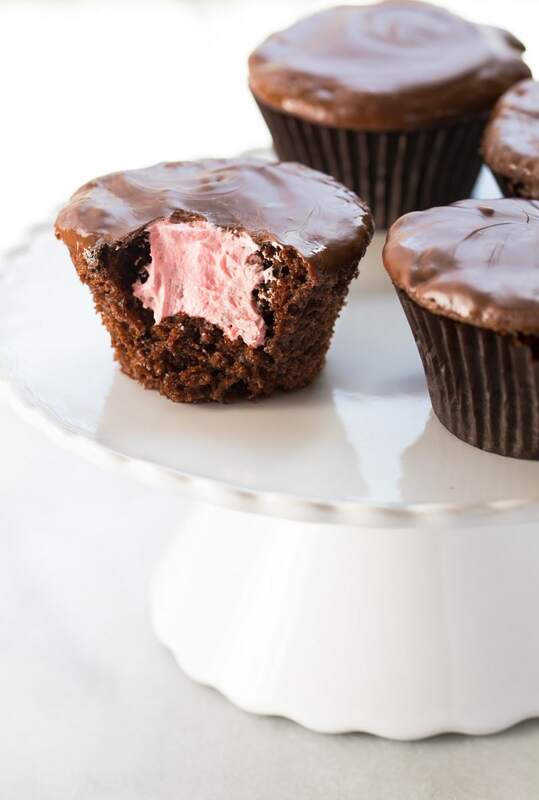 I saved a small scoop of strawberry marshmallow fluff after making my strawberry rice crispy treats, and used them as the filling in these cupcakes. But, plain vanilla marshmallow cream is excellent, still. It’s also way more authentic to regular ding dongs. So is that little white frosting curlicue thingie that should be on the top, but I’m not about to attempt that. Forgive me? Preheat the oven to 350, and line 4 cups with cupcake liners in a muffin pan. In a small bowl, whisk together the flour, cocoa powder, baking soda, and baking powder. In a medium bowl, whisk together the espresso powder (if using), oil, vanilla and brown sugar. Add half of the dry ingredients to the oil mixture, and mix well. Then, add half of the buttermilk and continue to stir. Finally, add the remaining flour followed by the buttermilk, and stir everything until evenly combined. Bake for 16-17 minutes, until the tops spring back and a toothpick inserted in the center comes out clean with only moist crumbs clinging to it. In a small bowl, beat together the marshmallow fluff and butter until light and fluffy. 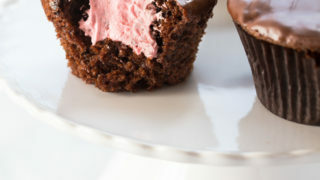 Scrape the marshmallow mixture into a piping bag (or plastic bag with the tip cut off), and insert a large frosting tip. Pipe the marshmallow filling into the center of each cupcake. (See photo for reference). Watch the surface of the cupcakes carefully as you pipe the marshmallow filling inside--it will slightly puff up when it's at capacity. Next, melt the chocolate and coconut oil in 30-second pulses in the microwave. Dunk each cupcake upside down in the melted chocolate, and let set before serving. poor Camille and poor you! you def deserved some chocolate and these homemade ding dongs look a million times better than the storebought kind! Love this! I don’t have kids but I definitely have those weeks where I need a bite of junk food! These look great! Ugh I feel ya. Lars had some major sleep regression on vacation and paired with a missed flight because of a delayed flight resulting in having to stay overnight in Dallas instead of in my comfy bed, I am in need of some serious chocolate. And a 10 hour nap. But first, chocolate. Love that this recipe only makes 4! Ding Dongs are totally a childhood favorite! These are adorable, the contrasting fluffy pink middle is the cutest thing. Can’t wait to cook these up for my husband. Maybe with a dash of strawberry liquor. Put some royal icing swirle on top and you have H* cupcakes too, ???? Girl, you outdid Little Debbie like no other with these! Sometimes we all just need a little chocolate therapy! These were AMAZING!!! Kids loved them too. I will be making these for all birthdays and functions.